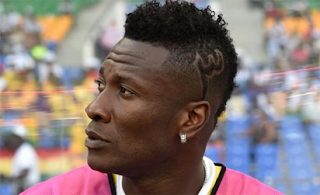 Ghanian international and former Sunderland striker Asamoah Gyan is among a group of over 40 players termed to have "unethical" hairstyles under the United Arab Emirates Football Association (UAEFA) rules. Gyan, who is 31 currently plays for Dubai based Arabian gulf league side Al Ahli, he is on loan from China's Shangai SIPG. Some Islamic teachings ban "Qaza" hairstyles, where part of the hair is shaved. Some match officials in the UAE enforce the rules because they are concerned about children copying the hairstyles.